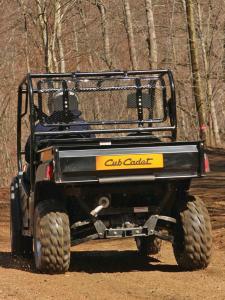 Cub Cadet is a company that was formed over five decades ago to serve the American dream. The rapidly swelling ranks of post war baby boomers were moving to the suburbs and country by the millions and buying homes with plenty of grass for kids, dogs, or playing catch. Between the picket fences and the front porch though, there was a lot of grass to cut and snow to push, and nothing could be more rural than a small tractor in their small field to get the job done. It was all part of the rural, open-air dream, and Cub Cadet met that need by building humble yet sturdy, reliable, bright yellow garden tractors that fit in perfectly. They were grass farmers, at least on bright Saturday mornings. Today Cub Cadet still builds garden tractors for cutting grass, and it’s common to see a Cub Cadet old enough to have grandchildren still out working its little field. 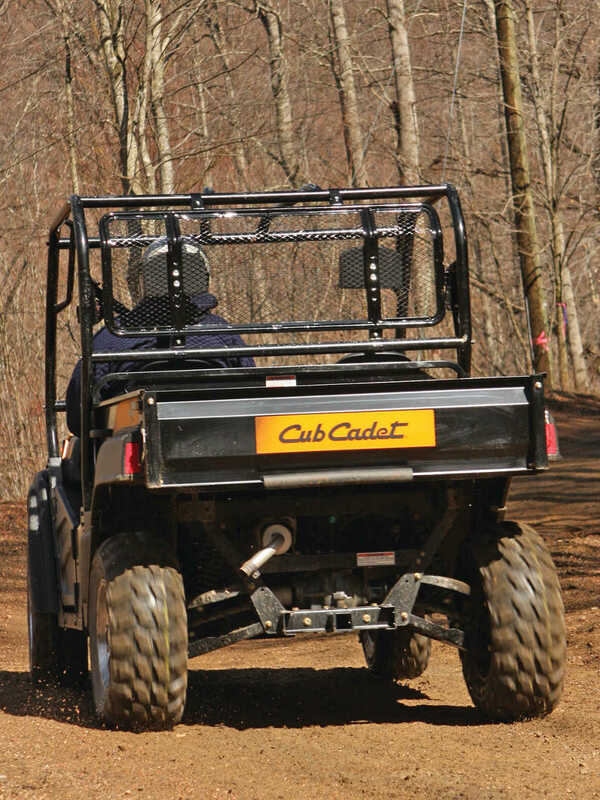 Some things haven’t changed much at Cub Cadet and those traits from the first garden tractor of being tough, reliable, innovative, and user friendly have been applied to other products as well. The enormous growth of Side x Side ownership by those same rural customers was not lost on Cub Cadet either, and their Volunteer line of hard working Side x Sides was meant to meet their needs. 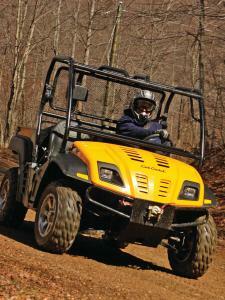 We needed to take a closer look at Cub Cadet’s new dream machines. The Volunteer is wide and low by UTV standards, so getting in and out is easy and quick. 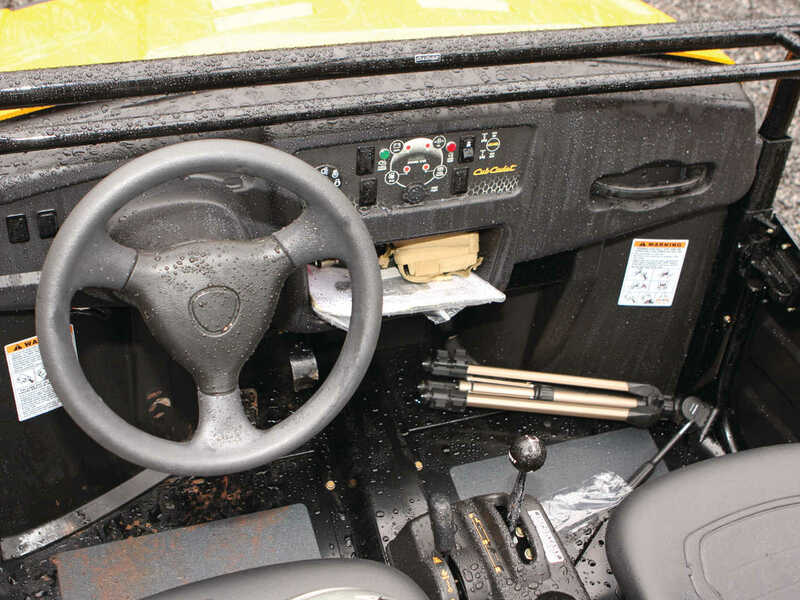 Half doors keep your feet safely inside the cab area and add a little more protection from splashing water or from anything else trying to poke its way into your lower leg. We like the quality, comfy, adult-sized bucket seats, and three-point seatbelts. Dual cup holders are found in the center console and between the seats is the gear shift lever and 4wd lever. To the left of the driver’s seat is the parking brake. 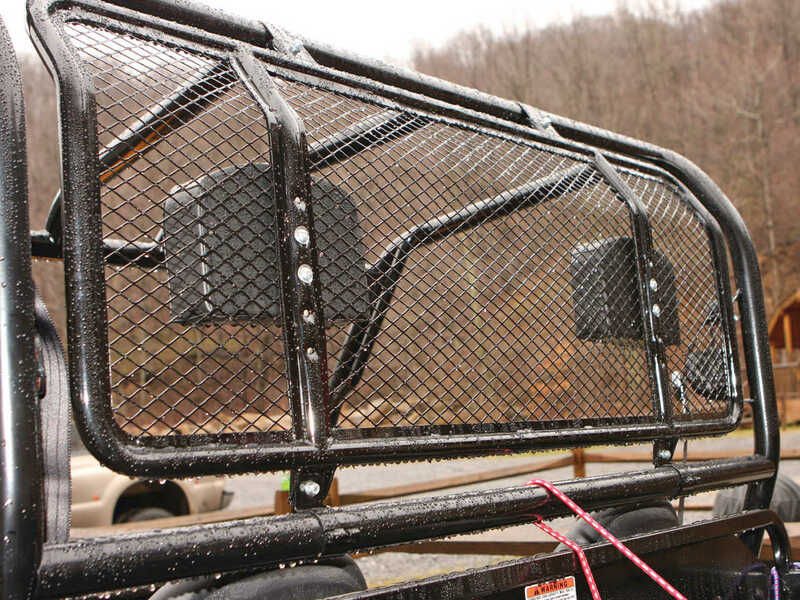 Across the entire front of the cab and above the dash is a sturdy grab bar, and there are grab handles on each upper frame rail. On the dash are several warning lights, with a small, open storage compartment just below. Rather than a digital or analog display, the multi-functional display contains an illuminated hour meter, low fuel light, over-temp light, low battery light, parking brake light and a 12V port. It’s functional, but Cub Cadet really needs to convert the multiple lights into a multi-function display system with an integrated fuel gauge rather than a simple low fuel light. When competing machines offer sophisticated instrumentation as standard equipment, it’s hard to justify not offering it on a machine of this quality. Overall, the Cub Cadet Volunteer cab is functional and comfortable for two hefty riders. At almost 64" wide and weighing 1,650 lb., the Volunteer 4x4 EFI is a big machine and it’s built solid! 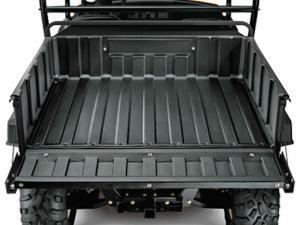 The flooring, the cargo box, the 3" ladder-style frame and a heavy front bumper are all built to last. Suspension members are made from stamped steel, which effectively makes them excellent protection for the lower drivelines and CV joints as well. At the rear is a 2” receiver hitch for any towing jobs and the front bumper is ready for an accessory winch. Thanks to its wide footprint, it’s also extremely stable and ground clearance is listed at 11 inches with a 12 inch step to the cab floor. All Volunteers have distinct, functional styling. The tough, polymer hood is sloped for a better view of the terrain ahead, and whether you’re crawling over rocks or through the woods, it’s easy to see the trail or any obstacles. Top louvers in the hood direct air through the large radiator, strategically angled under the hood and away from the impact zones. Adding to the exterior protection are extended fender flares that do a superb job of keeping the mud off, and attention-grabbing alloy wheels with 26" Goodyear Rawhides add some pizzazz. Constant Velocity (CV) joints are located on each wheel with a protective rubber boot, and a steel deflector is built into the frame / suspension to protect the boot from tears. All Volunteer models are built to handle any job regardless of how tough, yet be capable of a little weekend recreation as well. Consider them the working man’s UTV. Adding to the Volunteer’s overall appeal and traction is four-wheel independent suspension with dual heavy-duty steel A-arms. The 8” adjustable coil-over shocks give it a smooth ride and the stiff frame helps it keep its composure in turns even with a loaded cargo bed. The Volunteer stays planted in corners with very little body roll or tippy feeling. Overall, the suspension is decent--not as plush as some of the recreational UTVs, but it works quite well in slow rock-crawling and when carrying a hefty load in the box. 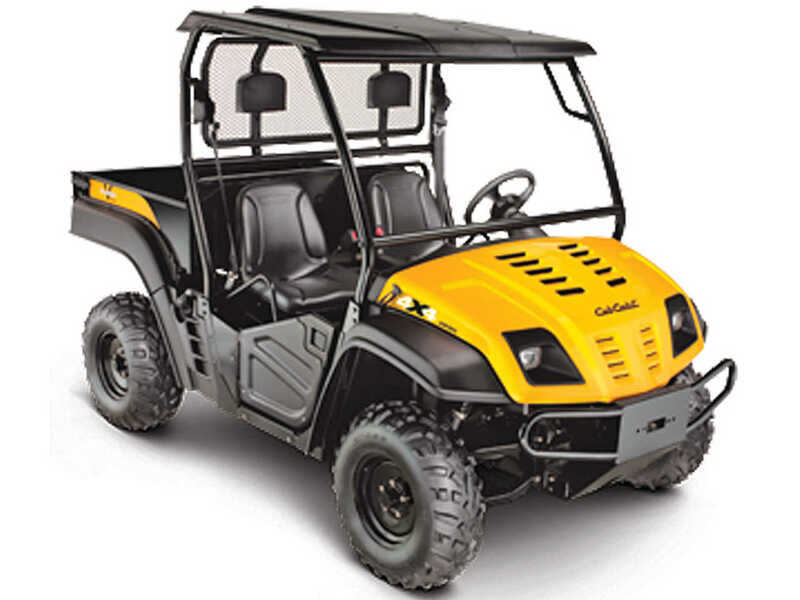 Just like John Deere, Cub Cadet does not have a stable full of their own small engines from an ATV lineup and they must source their power plants from another manufacturer. 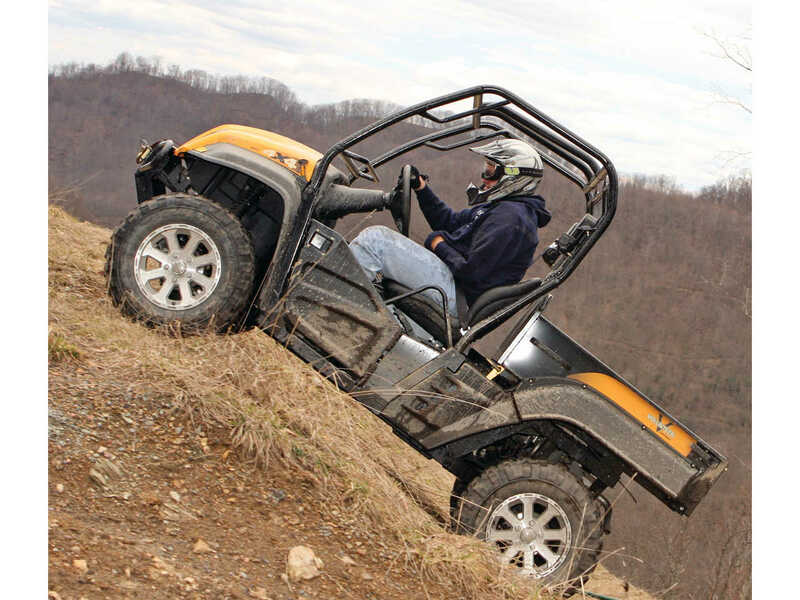 That’s not a problem, and the Volunteer 4x4 EFI comes with a 31-hp, Kohler Aegis, V-Twin EFI engine, the flagship engine on the Volunteer line. This engine offers 25% more power than other work oriented machines such as the Gator diesel and the MULE diesel, with enormous torque and pulling power. The Volunteer 4x4 EFI could seemingly pull your cabin out of the woods, and whether it’s fully loaded with firewood or towing ground working equipment for your food plot, the Volunteer will get the job done. Even climbing steep mountains of the Hatfield-McCoy trail system was not a problem. The Kohler’s Aegis-class engines boast a number of user-friendly features such as dual oil drains, easy-access oil fill, low-oil protection, in-line fuel filter and top- or low-mount wire connections, but we wish the dipstick was a little easier to reach. Cast-iron cylinder liners and aluminum block construction complement a four-cycle, overhead-valve, twin-cylinder design. Hydraulic valve lifters reduce valve noise and compensate for valve wear, and this eliminates valve adjustment and ensures full power output throughout the life of the engine. Change the oil and keep the air filter clean and you’ll have no problems with the Kohler power plant. The advanced Aegis engine produces more power while reducing engine temperature and oil consumption, and fuel economy seems quite good as well. The large radiator under the front hood keeps the engine cooler for long-term durability and Electronic Fuel Injection (EFI) insures consistent performance and excellent starting at any temperature or elevation. Like the chassis, the Kohler Aegis engine is a solid performer. The Kohler engine is connected to the CVT transmission through a Hurst linkage system directly connected to the transmission to provide positive engagement. The transfer case is a cast-aluminum housing, and all gears are submerged in an oil bath for constant lubrication. Engine power is then directed to a sealed CVT with a safe water fording height of 22” to the air-inlet under the passenger seat. Believe us, we tried it and had water running through the cab, yet the Volunteer kept paddling forward. The transmission also shifts well and Low Range power is something you really need to experience. It was no problem dragging downed limbs from a spring wind storm back into the woods thanks to the enormous torque and true 4WD Hilliard traction system. If you’ve got a load to tow, the Volunteer can get the job done! 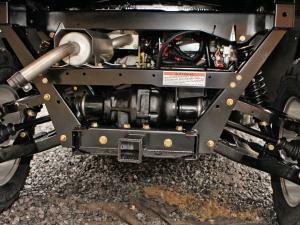 Hilliard’s are some of the best, if not the best traction differentials on the market. 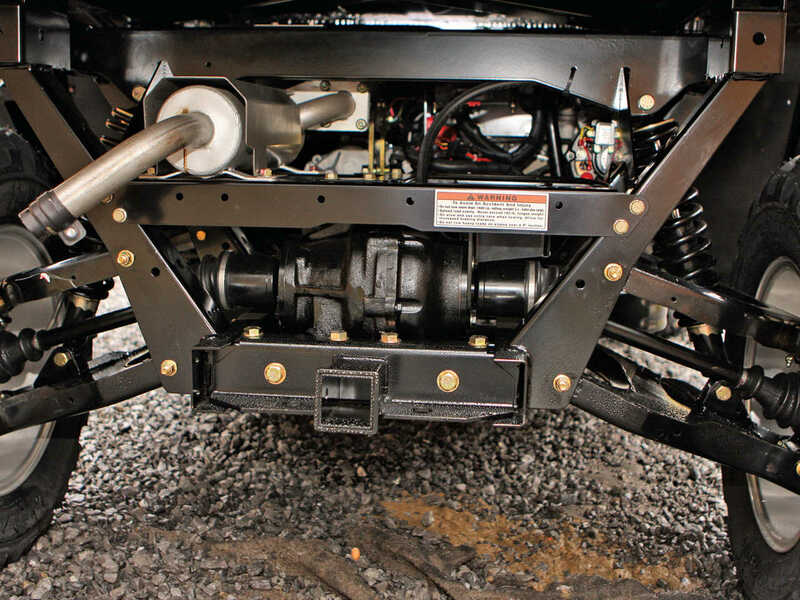 The Volunteer 4x4 EFI (And all 4wd Volunteers) are equipped with a Hilliard front differential system and a hand-operated mechanical locking rear differential. The Hilliard’s front differential gear assembly allows a driven wheel to turn at a different speed from the wheel on the opposite side of the vehicle and still have full power. 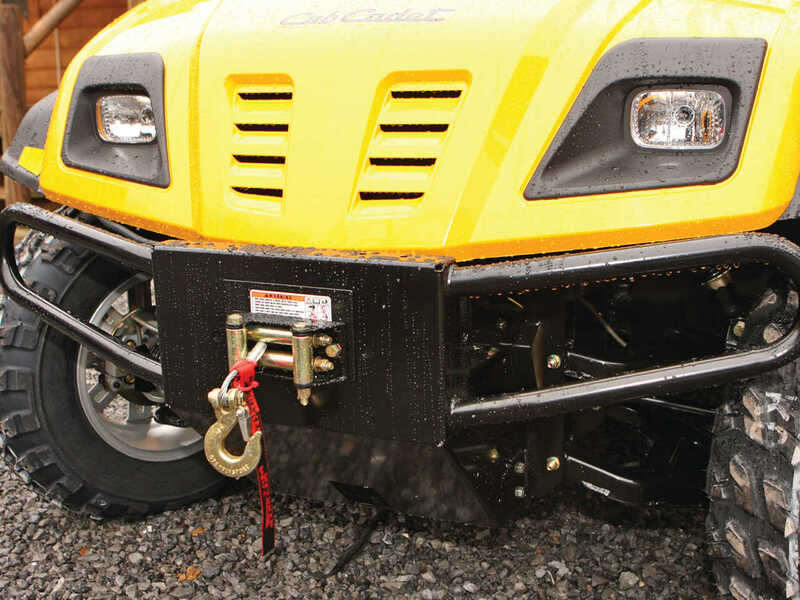 Limited-slip front differentials on some competing 4WD vehicles only have three traction wheels, but the Volunteer’s true 4wd system keeps all wheels digging for traction. 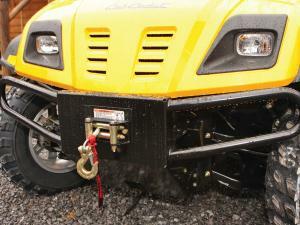 The Hilliard system “locks” both front wheels (in forward and reverse) yet still allows easy steering and traction. A rocker switch on the dash engages the front differential. It takes a strong set of brakes to stop this much weight, especially with a fully loaded cargo box or trailer behind, and the Volunteer's brakes are up to the task. 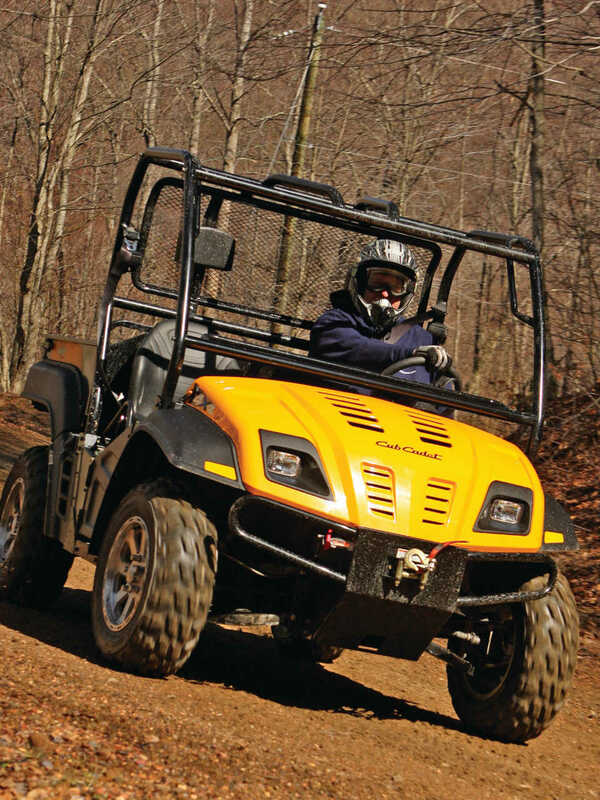 Four-wheel, 8” hydraulic discs with braided stainless-steel lines provide secure stopping in all conditions. The only limit will be traction. A hand-operated mechanical disc parking brake locks the vehicle in park, and for safety purposes, stalls the engine if you place it into gear while the brake is on. 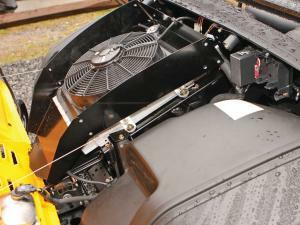 The brake fluid reservoir is easily accessible under the hood. The braided steel lines are a nice touch for durability, but they also insure a consistent feel at the pedal since the lines don’t flex under pressure. 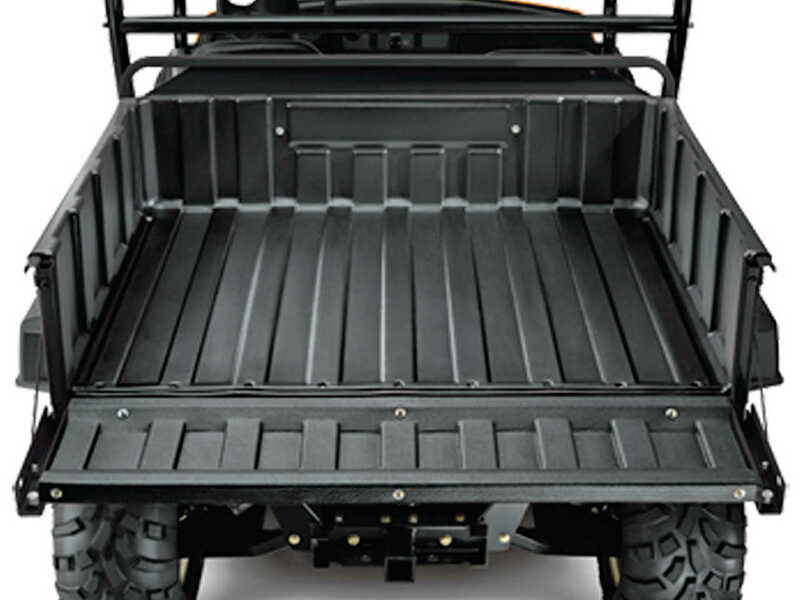 The Volunteer 4x4 EFI comes with a heavy duty, 14.4-cu.-ft. steel bed and is big enough to carry a pallet and deep enough to keep items inside during transport. The bed is also rubber isolated from the frame and has a gas shock, operator handle, and pivoting tailgate for easy dumping. A 2” Class 1 rear receiver is standard on all Volunteers and an optional front receiver is available. A glove box and under-seat storage tray are included to store smaller items and a 450 amp. battery is located below the driver’s seat. We especially like the protective screen between the bed and the crew compartment which offers an additional level of safety. The Volunteer 4x4 EFI is an excellent work companion, but we wanted to give it a thorough trail test as well. With its wide stance and low center of gravity, it would be extremely stable, especially on the never ending, off-camber trails of the Hatfield-McCoy system. On the trail there was no terrain it couldn’t conquer—and believe me, we tried to find some. Over rocks, logs, and mud, the Volunteer kept going, and inside the vehicle the bucket seats gave it a much sportier feel and held our back side in place. At 32 mph, it isn’t exactly the fastest machine on the open trail, but it gets up to speed quickly and that’s fast enough for most riders. Thanks to the capable 4wd system and four-wheel independent suspension with 8" of travel, you can work or play with this machine in confidence. We even drove it through water deep enough to flow almost up to the seat, but the Volunteer never had a problem. It also steers well on the trail, and about our only complaint is with the front wheel well which does take away room from your outside foot. In that respect, it’s a little bit like some of the John Deere Gators, but with far more torque and better suspension. Most owners use their machines for both hard work and play. The same machine that hauls bales, cement blocks, and tools during the week also hauls white tails, camping gear, and coolers on the weekend. That’s us too, and we would have no problem using the Volunteer for both. You can’t ask for more than that. Cons: Needs digital instrumentation & fuel gauge, firm gas pedal, wheel-well intrusion, oil dip stick could be easier to reach, not overly fast. Front Tires 26" x 10"-12"
Rear Tires 26" x 11"-12"